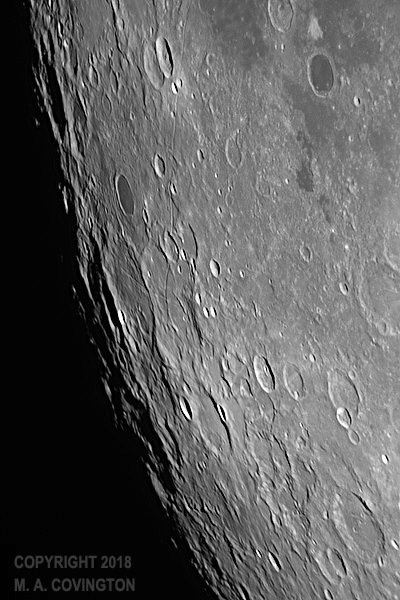 Even when the moon is full, there's generally some area around the edge where craters are clearly visible. Last night (April 29) it was near the moon's south pole. 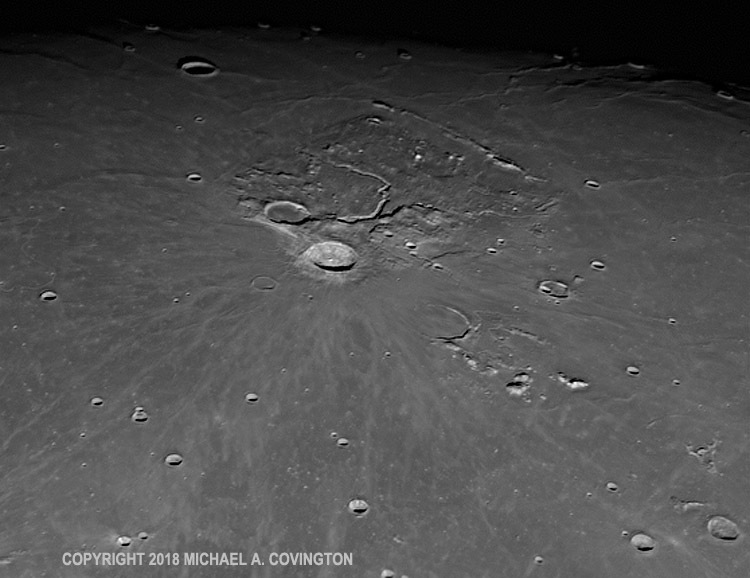 The most prominent crater, below center with a small bright crater below it, is Schomberger. The air was considerably steadier than the previous night, and I got good pictures. This is a stack of many video frames captured in infrared with a DMK21AU04.AS camera and 8-inch Celestron EdgeHD telescope. Here's a Jupiter picture that more or less does justice to the telescope that took it. This year Jupiter is in the part of the Solar System toward which the earth's south pole is tipped, so those of us north of the equator are not going to see it very high in the sky, meaning that we're looking through much more air (and turbulence) than our Australian colleagues. But this is at least reasonably good. Similar setup, but using a DFK (color) camera and a 2× converter in front of it to magnify the image. Those video images ended up being recorded with IC Capture, under Windows, after both oaCapture 1.4.0 (under Linux) and FireCapture 2.6.07 (under Windows) let me down. Under Windows, I can't capture video faster than 15 frames per second with complete reliability. At 30 fps, frames start being dropped, and at 60 fps, the camera hangs. The FireCapture problem that I wrote about back in March 2015 bit me because I had upgraded FireCapture (to 2.5.10) and forgot to tell it not to select fps rates automatically. But new software versions also caused problems. Since the previous night, I had upgraded from oaCapture 1.3.0 to 1.4.0 for video capturing (at 60 fps!) under Linux. Mysteriously, 1.4.0 will not talk to the DMK camera — "Cannot connect camera," it says — even though the DFK camera works fine. During the observing session I didn't get as far as trying the DFK camera with it. Today I simply went back to 1.3.0. Today FireCapture also gave me mischief. During the day I upgraded to version 2.6.07 and immediately had serious camera problems — not only with FireCapture but with IC Capture! Since IC Capture comes from the camera manufacturer, I thought the camera was broken. It turns out FireCapture 2.6.07 was setting the gamma of the camera to 1 instead of 100, thereby producing a super-high-contrast image, and the setting stuck when other software tried to access it through the same driver. So... back to 2.5.10. 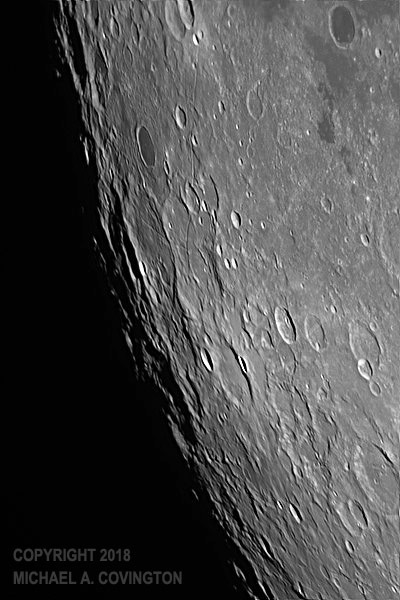 Can you see Mare Orientale from here? Roughly speaking, the left half of this picture is on the far side of the moon and never turns toward us. 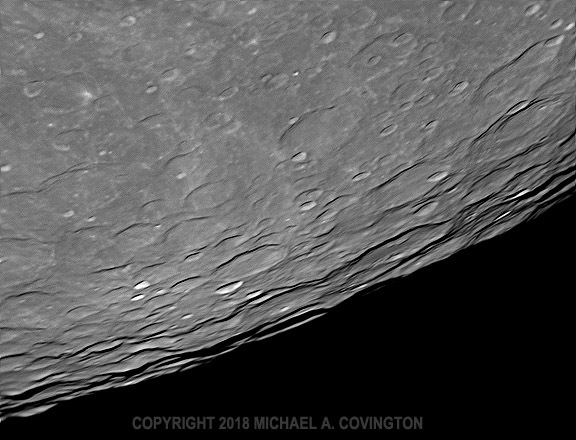 But the surprising thing is, you can see part of Mare Orientale from Earth, at least under ideal conditions. Its two mountain ranges have long been known as Montes Cordillera and Montes Rook. There is actually some controversy about who discovered the plain itself (Mare Orientale), but it was definitely discovered and named before there were space probes. Here are two infrared images I got last night (April 28). You can just see Montes Cordillera as the most distant mountains at the lower left. 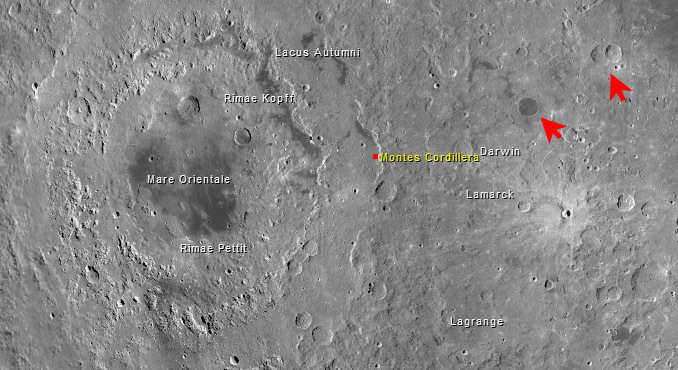 The craters marked with red arrows in the atlas picture will help you get oriented; they are at the top of my pictures. I've done much better. Photographing Mare Orientale from Earth is one of my minor hobbies. For better attempts click here and here. Again, the map above will help you get oriented, especially the dark crater marked with a red arrow. 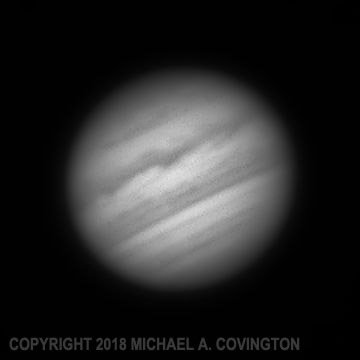 Here's Jupiter from last night (April 28), 8-inch telescope, DMK camera with IR-pass filter, stack of hundreds of video frames. This is an infrared image, and you can see the Great Red Spot (bright in infrared) rotating off the visible face of the planet at the lower right. About those copyright notices: I'm not trying to look egotistical, nor mercenary. But I've had an unpleasant experience where an "artist" stole one of my moon pictures and passed it off as part of his "work of art." All my pictures are protected by copyright law, whether or not they are marked with a copyright notice. If you want permission to reproduce one of my pictures for some other purpose, please ask. 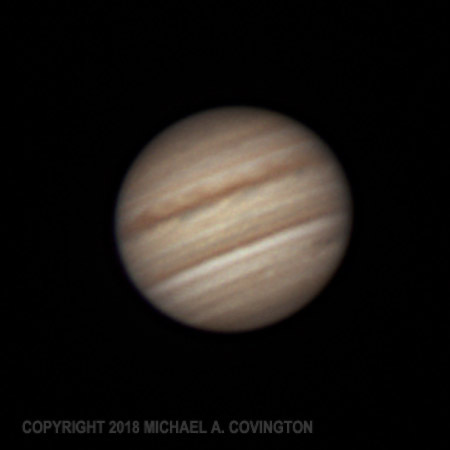 Jupiter is back in the evening sky, and despite still quarantining myself to avoid the risk of spreading the shingles virus, I was feeling well enough to get out the telescope on the evening of the 27th. The air was very unsteady, and I'm surprised I got this much. My main goal was to get experience with Linux and oaCapture, and also with doing the final sharpening with PixInsight rather than RegiStax. I used an infrared-pass filter on my DMK camera because the air is steadier in infrared. Even so, it wasn't very steady. 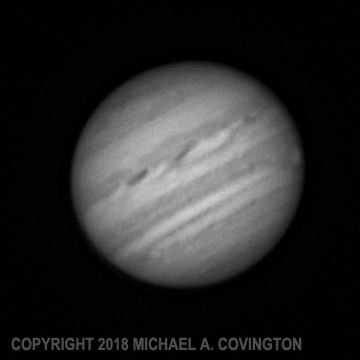 Celestron 8 EdgeHD, 3× converter, DMK21AU04.AS camera, IR-pass filter; software, oaCapture, AutoStakkert 2, PixInsight (Multiscale Linear Transform). The secret to taking a sharp picture of the moon under poor conditions is not to magnify it too much. For 50 years I have been publicly identified as a Christian. 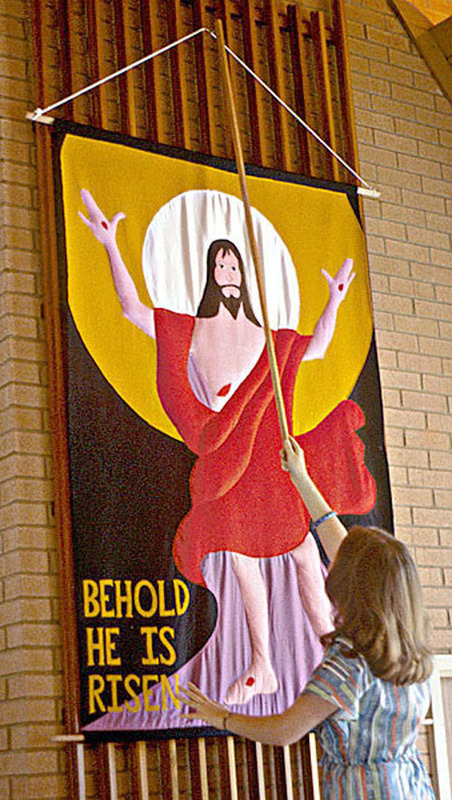 On Sunday, April 28, 1968, I walked down the aisle at the First Baptist Church, Valdosta, Georgia, as a public profession of faith in Christ, having met and prayed with the pastor earlier, and as best I recall, I was was baptized the following Sunday, May 5. At the time I was not quite 11 years old, but I was already aware that scientifically inclined people are often expected not to believe in God, and I already felt, as I still do, that the expectation was more peer pressure than logic. See this link for more about that. I'm having a few sick days, as I appear to be suffering a mild outbreak of shingles (herpes zoster) on my face. We caught it very early. Sharon already had something similar (also mild, thank goodness) and I realized I had the same rash and rushed off to the urgent-care clinic. They started Valtrex (an antiviral drug) and nipped it in the bud. So I haven't had much pain. For the first day or so, one side of my face felt as if I had shaved with a dull blade, except that I hadn't shaved yet. It is still somewhat sensitive to touch, and the corner of my mouth feels as if I were getting a cold sore. There is a pinkish streak on my face corresponding roughly to the facial nerve. More to the point, the day before those symptoms started, I felt generally tired and sick. Fortunately, I'm feeling better. I'm catching up on my rest and staying home so I don't spread the virus; as I understand it, I'm much more likely to give chickenpox to a child than to give shingles to an adult. I am also not shaving until my face gets back to normal. I may be fairly hirsute by the end of this. Inconvenient, but it could have been worse! I replaced the volume and sensitivity controls, rigged a phono jack for the antenna connection, and made some power supply modifications described below. These are made by Precision Electronics Corporation in Canada and are available from Digi-Key. They aren't cheap — about $10 each — but they actually have higher power ratings than potentiometers of the same physical size from yesteryear. One bad thing that might happen to the Hallicrafters is that a capacitor might short and burn out the power transformer. The good news is that suitable transformers are still made — they are used in Fender guitar amplifiers. The bad news is that they cost something like $100. A while back, when I modernized the power supply, I added a 2-amp fuse in the incoming AC line. That takes care of shorts within the power transformer itself. Such a short would burn out the transformer, but it prevents the situation described in a memorable passage of The Art of Electronics: "your power transformer becomes an incendiary device, dissipating as much as 2 kW" (or something like that). A short on the output of the transformer is a different problem — and is likely, because shorting is one of the main failure modes of filter capacitors. In that situation, the transformer would be overloaded enough to burn out the high-voltage winding (after several minutes) but might not blow the fuse on the incoming line because only part of the transformer is overloaded, and the percentage increase in total load is not that great. What can be done? For my amusement I've been reading back issues of Radio-Craft from World War II. They are full of advice useful to today's old-radio enthusiast, about how to make thing last longer and how to fix them with improvised parts. One wise suggestion was to protect the high-voltage winding of the transformer (which should deliver no more than 70 mA or so) by putting a 150-mA low-voltage pilot lamp in series with its ground lead. (Since the current is limited, a 6- or 12-volt 150-mA lamp would not burn out — would not even light up in normal use. But a short circuit would make it go out in a blaze of glory, saving the transformer.) I figured a fuse would be better, but then realized that neither fuse holders nor lamp sockets are normally rated to withstand 350 volts. What I did have was a Yageo 2-watt fusible resistor with a suitable resistance (100 ohms). "Fusible resistor" (or "flameproof resistor") means it is designed to burn out safely if overloaded, just like a fuse. These are my usual resistors for fixing vacuum-tube equipment, and they are rated to withstand 500 volts. The high-voltage winding could still burn out if the 5Y3 tube were to short plate-to-plate. But that is very unlikely; it's not a known failure mode. What's important is that a $2 capacitor is no longer in a position to take out a $100 transformer. The resistor also takes a few percent off the B-plus voltage, which is good because our AC line voltage is presently 122 volts (as actually measured by my UPS) and the radio was designed for "105 to 125," or more commonly, in the 1950s, 110 to 115. And that brings me to another thing. I measured the tube filament voltages with a modern true-RMS voltmeter and got 6.9 volts. Ouch! That's enough to shorten the tubes' lives appreciably; it's supposed to be 6.3. So I added some resistance (actually two 0.1-ohm resistors in series) to the filament supply. Besides bringing the voltage down to the correct value, the resistors have a considerable anti-surge effect. What I mean is this: Tube filaments draw more current when cold than when warm, so when a radio is first turned on, there is a surge of current and the tubes are likely to burn out. The resistors limit the inrush of current. A note about filament voltage: Don't take it down below normal; according to what I've read, the emissive coating on the cathode can be damaged by prolonged operation at too low a temperature. (Conversely, tubes that have lost emission can be "rejuvenated" by running them hotter than normal for a few minutes.) However, the people at Hallicrafters put a resistor in series with the filament of the 6H6 detector diode and seem to be operating it at about 4.5 volts, for reasons known only to themselves. It is a very low-power tube and carries very low current. Continuing to think about yesterday's application of the theory of low-level differential signaling, I realized that my dipole antenna needs another thing — a matched load impedance. The key idea is that on its operating frequency, the output impedance of the antenna is about 75 ohms (which is also that of the cable). But noise at faraway frequencies, whether from local electrical noise or powerful local AM and FM stations, comes in with a much higher source impedance. The noise seems to be coming through a large resistor. Thus, supplying a terminating resistor (near 75 ohms) cuts the desired signal only a little, but the noise quite a lot. (This also shows the ferrite beads that I added yesterday.) 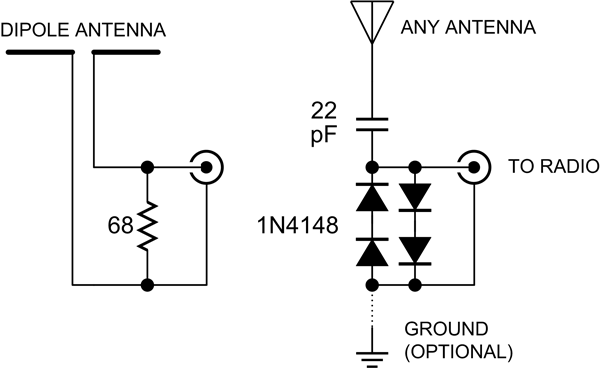 If you don't have an antenna tuner, you might want to put the resistor right at the input of the radio. 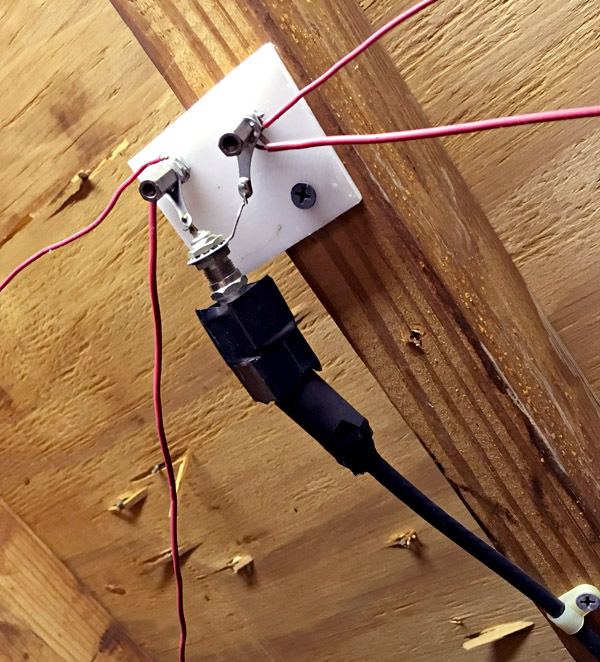 The art of how to make an antenna tuner is more than I can cover here, but it's basically quite simple: find a couple of variable capacitors, a multi-position switch, and a coil, and experiment. It's remarkable how much it will improve your shortwave reception. Just tune it by trial and error — it's easy to find the "hot spot" for the band you're listening to. A good starting point is a pair of 365-pF capacitors (or just one, at the output) and a coil that will give you a choice of using anywhere from 2 to 200 turns of wire around a 1-inch form (which in my case was a film can). My switch actually has 12 positions, and my tuner goes all the way down to 100 kHz, with extra coils, because I was interested in longwave. It makes me feel old to see that I built it thirty years ago. If you do want to build one, see the handy advice here and here. Breadboard it before you build it, to see if it gives the desired frequency range with your antenna and your radio. You don't need the power-handling capacity that a tuner for a transmitter would need, but a tuner designed for transmitters can certainly be used for receiving. If you'd rather buy than build, the MFJ shortwave antenna tuner is widely used and well respected. If you happen to have a Sony ICF-2010 (one of the best shortwave radios ever made), here's an important tip. 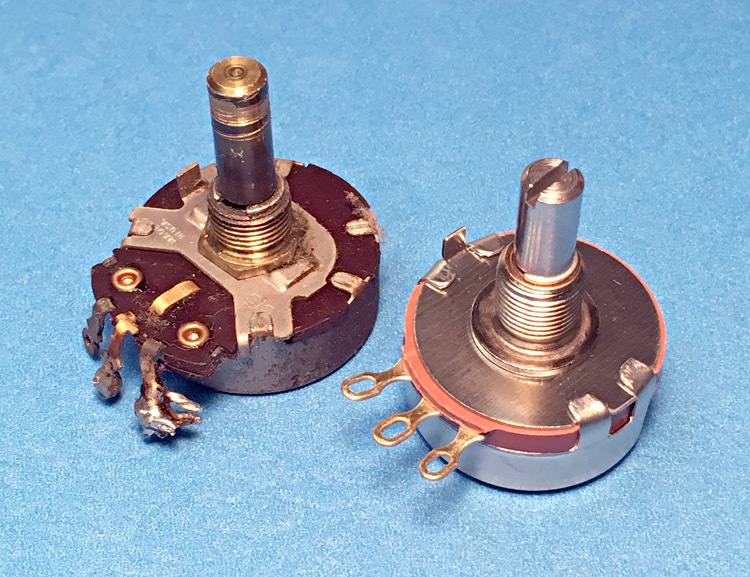 Back in 1992 I published on Usenet, and in 2008 I republished here, a note about a transistor in the Sony ICF-2010 that is often damaged by static electricity or thunderstorm-induced surges from the antenna. Since the damage only causes a loss of sensitivity, it can go unnoticed. Testing the transistor with a voltmeter is easy, and no surface-mount soldering is needed to replace it. I also promoted a modification involving 4 diodes to protect against further damage. I no longer recommend that modification because the diodes (2 pairs of 1N4148s back to back) start to conduct at 1 volt peak-to-peak, and I found my antenna was picking up more than 1.45 V of 60-Hz AC noise. That is probably common. What that meant was that the diodes were conducting and degrading the input signal. Since it's a very good radio, the Sony still worked well, but not at its best. If you really want to do the internal modification, perhaps use stacks of four instead of two 1N4148's. Maybe someone can recommend a better alternative. But I took out the diodes I had added to mine. The 68-ohm resistor is a terminating resistor for a dipole antenna, as described above. It gives good protection against low-frequency electrical noise and strong signals from other bands (e.g., FM broadcasts) if you are using a tuned dipole. If you use your dipole outside the bands it is tuned for, and you don't use an antenna tuner, then make it larger, up to 1000 ohms. Note that it is not suitable if your problem is a nearby transmitter that could put a high voltage on the antenna at the frequency it is tuned to. Alternatively, use the diodes downstream of a capacitor that will eliminate much of the low-frequency noise before it gets to the diodes, or downstream of an antenna tuner. 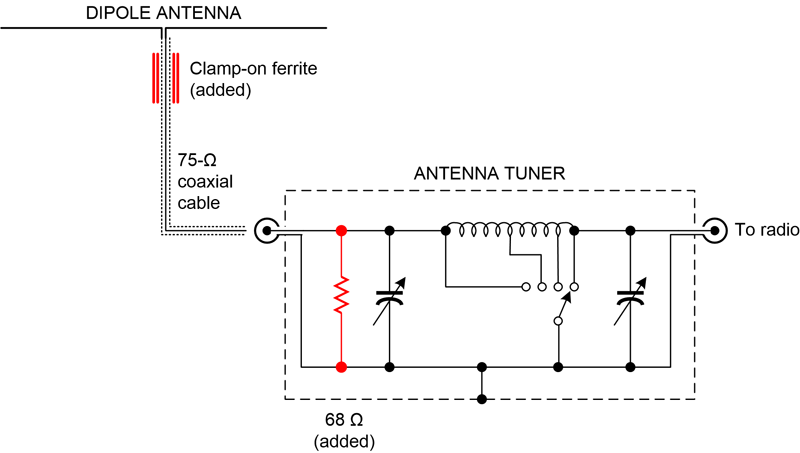 Do not mount a terminating resistor inside the radio, at least not just inside the antenna jack; it would also be in the circuit for the whip antenna, which is a high-impedance device and would lose most of its signal. 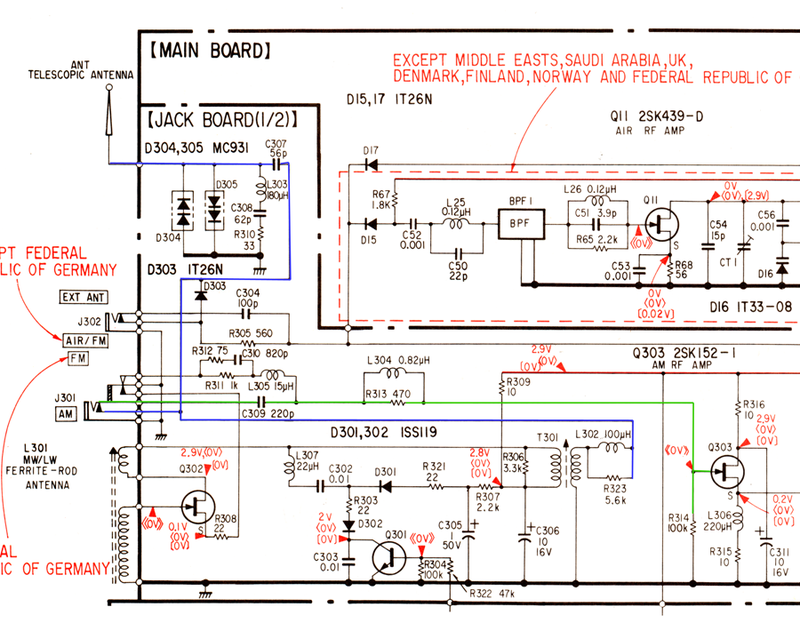 Instead, you might consider putting protective diodes at the gate of Q303 in the diagram below. More about how Sony did it: Here's Sony's complicated input circuit, with the AM antenna input highlighted in green and the whip antenna circuit in blue. They are connected together at the jack when nothing is plugged in. Q303 is the transistor that gets blown out (by static electricity that makes it past L305 and through C309). The switching functions of the antenna jack are complicated (and if your Sony 2010 is 30 years old, the way mine is, you might want to give it a squirt of contact cleaner; there's a lot going on in there!). When you plug in an AM antenna, two switches actuate. The lower one, involving the wires I highlighted in blue and green, disconnects the blue circuit (whip antenna and medium wave loop) from the input and connects the external antenna instead. The upper switch disables the loop antenna amplifier (Q302) and grounds the low side of the impedance matching, high-pass-filter network involving L305, which would otherwise be disconnected. I wonder if failures of Q303 are secondary to poor contact in that switch, removing the static protection that is normally provided by L305 and R311. This is the feedpoint of one of the antennas I installed in my attic in 1990, when I was more active in ham radio. It consists of 7-MHz and 28-MHz dipoles in parallel. These days I use it for shortwave listening with an antenna tuner. The fat things on the cable are clamp-on ferrite beads, just now installed. I'm having my awareness raised about a point of antenna theory. Specifically: when a half-wave dipole is fed by a coaxial cable, the impedance is all right (75 ohms), but the cable shield isn't just a shield. At the radio it's grounded, of course, but along its length it becomes a third leg of the antenna. The dipole is really a dipole in series with a random-length monopole. Thus the ferrite beads. They are a common-mode choke to keep RF currents off the shield. Theorists will recognize them as a type of current-mode balun. I used what I had and will add more. I don't know if these beads actually have good activity at the frequencies involved. My challenge for last night (April 19) was to find out which tracks better with PEC but without guiding corrections, my AVX (trained with PEMPRO a few months ago) or my CGEM (trained by averaging 9 guiding sessions a few months ago). Because it has integer gear ratios, the AVX should be smoother (PEC should be more effective). The result? CGEM wins by a small margin, and I haven't even used PEMPRO on it yet. I was pleasantly surprised. It may be that my CGEM is one of the ones where the non-integer term in the periodic error is small. To perform the test I photographed the galaxy NGC 3521 through my AT65EDQ refractor (6.5-cm f/6.5), taking 1-minute exposures with a Nikon D5300. Because the moon was in the sky, I didn't expect first-rate results. And in fact, due to an error setting the camera, I came out with JPEG files, not raw files, so I couldn't perform any calibration. Nonetheless, I stacked the JPEGs and did all right. 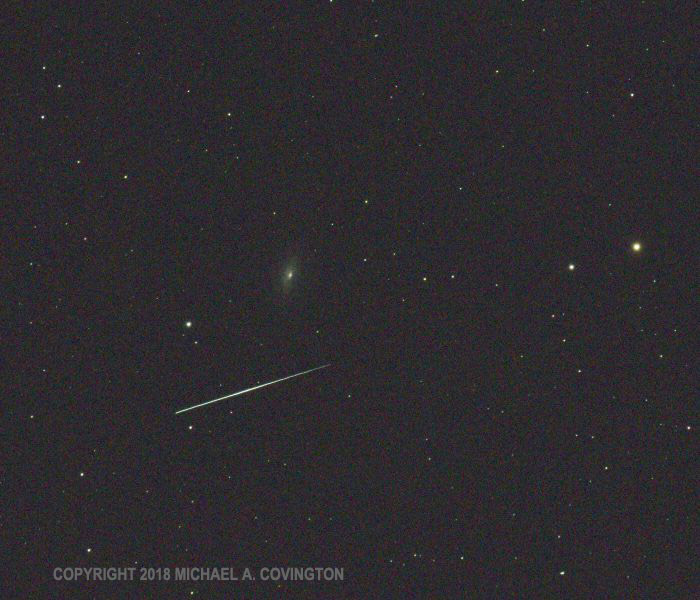 The upper picture is a single 1-minute exposure, showing a telescopic meteor (high-altitude meteor with a short path) passing right next to it. 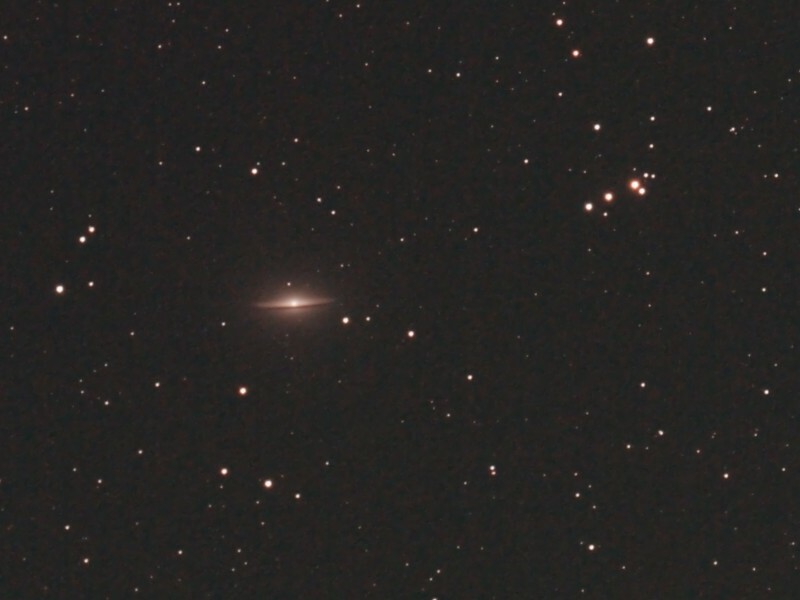 The lower picture is a stack of 36 1-minute exposures captured as JPEGs. 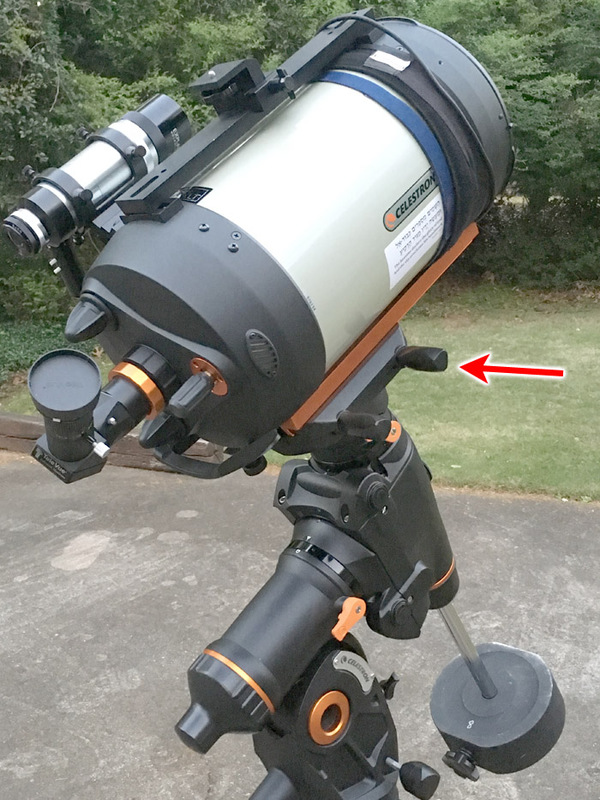 I wanted to set up my CGEM equatorial mount with the knobs for tightening the dovetail on the right, like the AVX, rather than on the left, where Celestron puts them. Presumably they expect you to be holding the telescope with your stronger right arm while you tighten the knobs with your left hand. I, however, usually arrive carrying the telescope in my left hand, leaving my right hand free to turn doorknobs and such, and I want the mount's knobs to be on the right. I was all set to take the saddle off the CGEM and reinstall it the other way around when someone on a forum (and I hereby thank them, though I've lost track of who it was) pointed out that you can simply rotate the saddle 180 degrees with the mount powered off, then turn it on, and go from there. The encoders assume the mount is in the correct starting position. So how do make sure you've rotated it exactly 180 degrees? Simple. Walk around to the front (poleward) side of the mount and put the declination index mark directly above the setscrew hole. This is actually easier than aligning the declination index mark in its usual position, on the back and under the telescope. I used a silver Sharpie to put a dot to facilitate lining it up. What if this dot is a degree or two off the intended position? Don't worry. As soon as you show the telescope where some stars are, it corrects any such error. In fact, it "learns" the error so that it can correct for it next time. The Hallicrafters radio seems to need a new sensitivity control, which, for obscure reasons of circuit design, needs to have a reverse logarithmic taper. What does that mean, and what does it have to do with left-handed guitarists? Well, a volume control is a variable resistor. Most variable resistors are linear (the resistance is proportional to how far you turn them; half scale is half resistance). But because the human ear perceives sound logarithmically, variable resistors used as volume controls have an "audio" or "logarithmic" taper, so that mid-scale is a good bit less than half resistance. Otherwise the middle of the scale would be too loud. The opposite taper also exists, and Hallicrafters uses it because their sensitivity control varies a bias voltage whose effect is nonlinear; a reverse logarithmic taper (where mid-scale is appreciably more than half resistance) makes things come out right. The appropriate replacement was hard to find; because of the high voltages involved I had to choose this hefty unit. But along the way I encountered left-handed guitarists! Or rather questions posted by left-handed guitarists. But if you wire an audio taper control backward, mid-scale comes out way too loud; the taper needs to be backward too. Hence the market for "lefty" volume controls. As I was putting the Hallicrafters back together and giving it its final checkout, I accidentally broke the dial cord for the band spread dial. I thought about leaving it that way but then found some dial cord in one of my 200 or so parts drawers and decided to fix it. This time I had something I didn't have before: the manufacturer's instructions. From them I learned that it had been strung incorrectly the previous 2 or 3 times, which is probably why that particular cord had broken about 3 times over the life of the radio. This time I did it right. It's largely a matter of being willing to take apart the front panel of the radio, which doesn't need to be taken apart for any other kind of repair. After putting the cord in place, I sealed the knots with glue and cut off the excess (shown here before the cutting). I do have one hint. When the instructions say to wrap the cord around a shaft two and a half times, give it four and a half. You'll get much better traction, and it won't affect the speed at which the cord moves (think about it). I can now truthfully say that this radio performs better, and is in better electronic (not cosmetic) condition, than at any time since my father got it in 1965. It is one of very few things I have from that era that I still use; a 7x50 monocular is the only other one I can think of. This evening I did yet another repair to my vintage Hallicrafters radio and fixed a problem it had had for at least 53 years. The symptom was a vague, faint sputtering heard through the speaker when in standby mode, when the radio should be silent. Standby mode is used by hams when transmitting and by everyone when warming the receiver up (it needs to run for half an hour to be fully stable, so one doesn't turn it on and off more often than necessary). 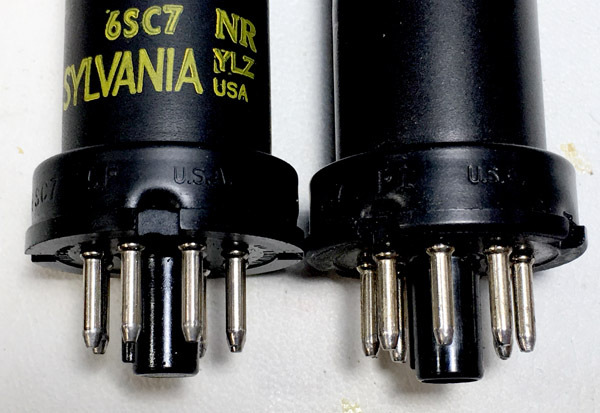 In our last exciting episode, more than two years ago, I suspected the noise was coming from the 6SC7 tube, a two-section triode used for the BFO and the first audio stage. But I wasn't sure. This year I revisited the problem and found that the plot had thickened in several ways. (1) Although still present, the sputtering was much fainter than I remembered it from 50 years ago. Sometimes it went away altogether for several minutes. This was also my experience while working on the radio in 2015 and 2016. (2) I found a much more reproducible symptom: With the BFO on (CW/AM switch set to CW), there was a constant low whine from the speaker in standby mode, and it never faded away. That more or less proved there was unwanted interaction between the BFO and the first audio stage. Curiously, I noticed that the noise was affected by the BFO switch (AM/CW switch) and would go away for a few seconds after flipping that switch back and forth. Apparently, running the BFO changed the internal temperature of the tube or something. So I ordered a new-old-stock 6SC7 from an eBay vendor. 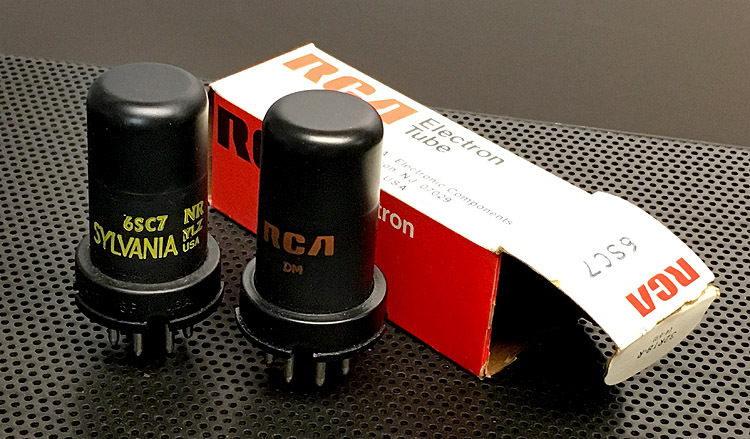 It was made by RCA in the last days of RCA's tube production, probably around 1980, as evident from the box style. (3) The tube already in the radio was of recent vintage too! I must have thought of all of this when I overhauled the radio in the late 1980s, and replaced the tube to try to cure it, with less than complete success. I must have gotten hold of a substandard tube! The two may even have been made at the same factory. Note the similar markings on the bases. That is not implausible, even though one is RCA and the other is Sylvania, because in the waning days of the tube industry, and even before the waning days, manufacturers did such things. But I am glad to report success. With the new tube installed, the sputtering is completely gone, and so is the whine in CW mode. Now, recapping how all this works... Back in 2015 I determined that grounding the grid of the first audio stage would silence the sputtering, but turning down the volume control wouldn't affect it. There is not much between those two points! Only a resistor and capacitor, both of which were changed in 2015. It had to be the tube. The two halves of this tube have completely unrelated functions. One is the first audio stage and the other is the BFO. Because the two halves share a cathode, the cathode has to be grounded, which it is. But there is probably more than the ordinary opportunity for unintended coupling between the two halves. 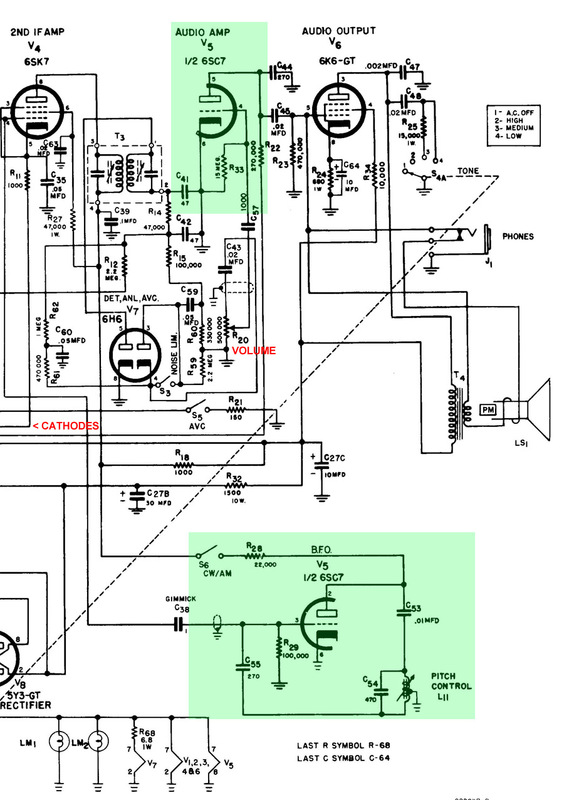 Something not part of this circuit, but worth explaining, is the line marked CATHODES. It is the cathode return for all the RF and IF stages and is not grounded. Instead, at the other end of the diagram, which you can't see, it goes to ground through a variable resistance (the sensitivity control) bypassed by a large capacitor (0.25 µF, quite generous for the capacitor technology of 1954). This provides a way to control the sensitivity of all the stages together. What's more, the standby switch breaks the connection entirely, disabling all those stages. Nothing wrong there. All I know is that the radio sounds better than ever. I long suspected (but couldn't prove) that the sputtering was present while listening to the radio, not just while on standby. It does seem quieter now. The Sylvania tube will be stored away and marked "Noisy." It can still be used as a temporary or emergency substitute. Here is what RCA says about that kind of tube. I know it is still popular in electric-guitar amplifiers, where the distinctive behavior of tubes is part of the musical instrument. Sovtek still makes it, but theirs is glass without metal around it, and I figured that in this situation, shielding is desirable. 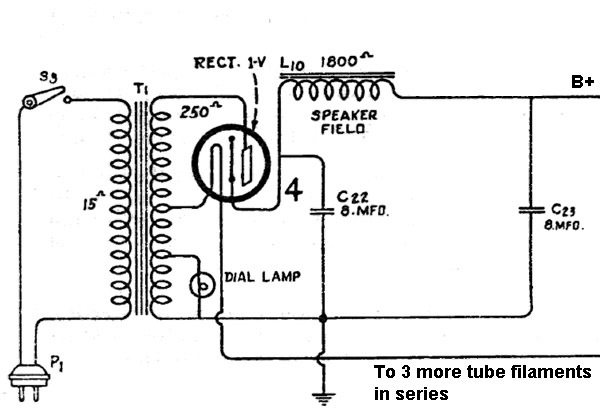 The 6SC7 was apparently intended to be used in a phase splitter (ahead a pair of push-pull output tubes), using two triodes joined at the cathode to give differential outputs, like the second diagram here (scroll down to it). Hallicrafters was going out on a limb by using the two triodes for completely separate functions. 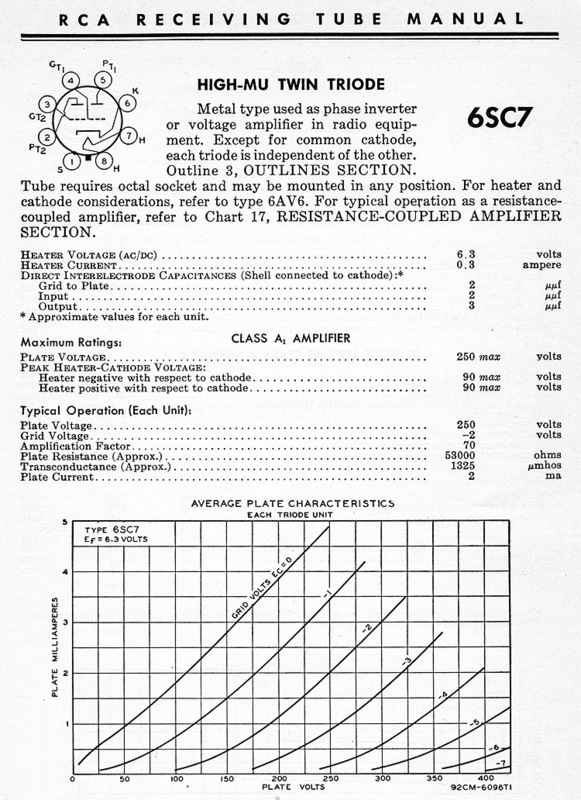 If I wanted to re-engineer the radio, I'd change the 6SC7 to a 12AX7 (a widely available tube, still made, that has separate cathodes). But I think redesigning to change a tube type, when replacements for the original tube are still available, is a bit much. Socket adapters do exist for putting a 12AX7 in place of a 6SC7 with no other modification. The other thing I did this evening was make it easy to connect the Hallicrafters radio to my good antenna (a 7- and 28-MHz dual dipole formerly used for ham radio). Radio Havana came booming in, and I also got a good signal from the Voice of Vietnam (quite possibly relayed from somewhere closer). 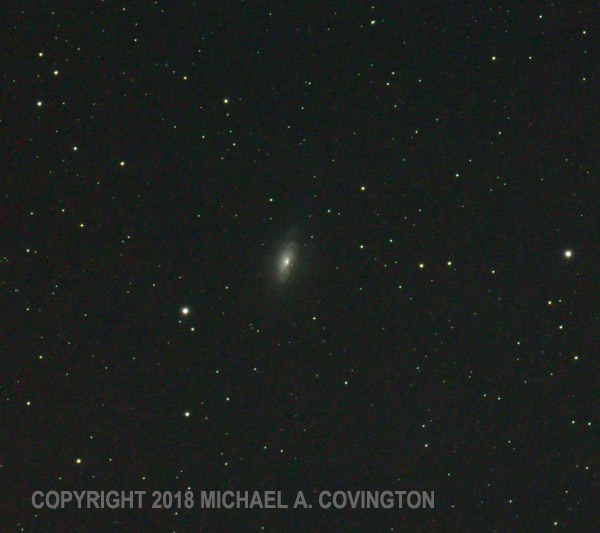 Here's the galaxy M104 in Virgo, encircled by a ring of dust that looks like a dark belt across it, and the "Arrow," a group of stars that point to it. More than once I have thought I was seeing the galaxy in binoculars when I was really seeing the Arrow. But the galaxy itself is one of the brightest in the sky (in surface brightness) and is a good choice if you want to show someone a galaxy in a telescope and the sky isn't as dark and clear as you'd like. 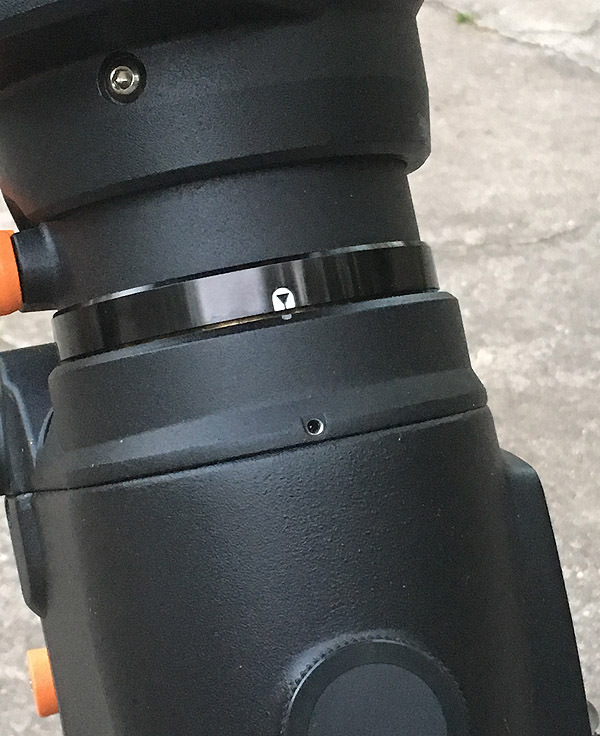 This was basically an equipment test: AT65EDQ 6.5-cm f/6.5 refractor, Canon 60Da with Astronomik CLS filter (which is no real help with galaxies, but I was using the same calibration frames as from another recent session, and so couldn't change the filter), AVX mount, autoguiding with PHD2 under Linux, which vacillated as to whether my camera was /dev/video1, /dev/video2, or not there at all. Stack of the best 15 of 20 3-minute exposures at ISO 800. Yesterday (Apr. 7) I went to Gwinnett Place Mall for the first time since 2011. I found it in a more advanced state of decay, only 30% occupied, but punctuated with small, well-kept stores that seemed to be thriving (such as Bath & Body Works). 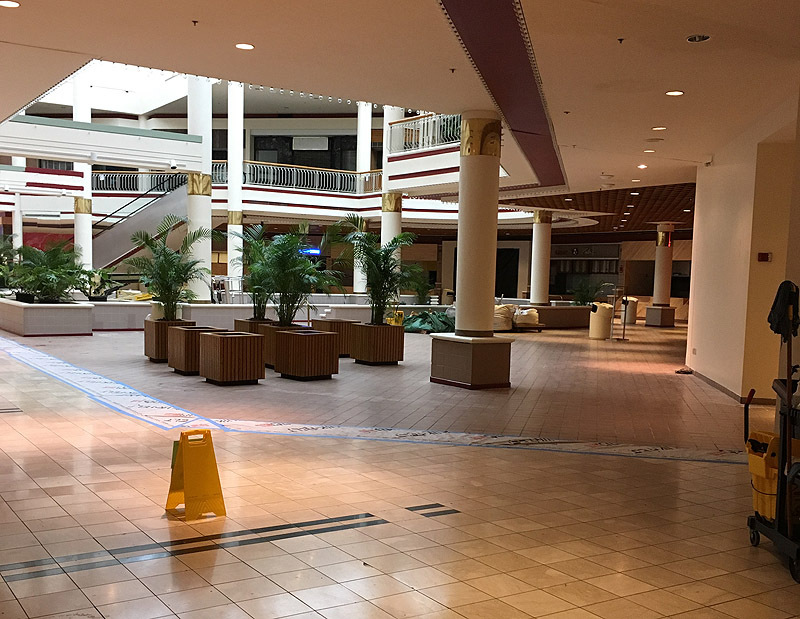 The food court, shown in the picture, was completely closed off. In fact, a person was found dead there a few months ago. This makes me sad. Malls have been the site of many happy times for me and many of my generation. I remember unexpectedly running into friends in malls in both Atlanta and Macon when in college; walking around Cumberland Mall many times with Melody when we were dating (and walking around Santa Anita Fashion Park, which is a mall, when we were newlyweds); it was an elegant, climate-controlled environment and didn't cost money to go to! We took the children to Georgia Square Mall and Gwinnett Place Mall many times. Now the malls are going away. Most people's glib explanation is, "Online shopping killed the malls." I don't think that's it. Malls never sold much of what online shopping is best at — books and other specialized items. And the world is still full of stores! Look at the way the big-box stores are growing along Scenic Highway in Snellville and Oconee Connector in Watkinsville. Prosperity as far as the eye can see! But most of the malls are dying. Brainstorming with family and friends, I've come up with several factors that are working against the malls. Bear in mind that I don't have sociological or economic data to confirm these speculations. People are busier. Going to the mall is a slow way to shop. Big-box stores cater to busy people who know what they want to buy and aren't out for a ramble. Related, people don't want to wait for sales — don't consider a big sale to be a cultural event — don't want to spend time seeing what's on sale. We want everyday low prices. Thank Walmart for that; it's their one big great idea. People spend less on clothes and jewelry than they did. Malls are anchored by big clothing stores (Macy's, etc.) and populated by jewelers and boutiques selling high-markup merchandise. Those are things people stop buying when there is in a recession, or when they just get busy, or when they stop feeling the need for status symbols. And there is a lot less social-class insecurity now than in 1970. People don't feel the need to prove that they've made it into the middle class. Malls must be unduly expensive for the merchants. As I said, the world is still full of stores, but they're not popping up in malls. Merchants no longer want to be in malls. It must cost too much. Local policies, taxes, or something are killing off shopping districts. The whole area around Gwinnett Place Mall, not just the mall itself, looks blighted; the shopping centers are better than the mall, but major merchants and restaurants seem to be moving out. Something similar is happening around Georgia Square Mall, where I know it's a matter of one county having higher taxes than the next one, and also roads having been gleefully designed (by the county that is the victim!) to route people away from that area. Malls are no longer teen hangouts, for several reasons. Parents no longer feel that it's safe to let their teenagers hang out in a place so full of strangers. Online communication makes teens feel less of a need to "hang out" — instead, they hear from their friends and meet specific people. And even the smoking ban in malls (which I welcomed!) has ended a certain kind of teenage hanging-out. Finally, there must have simply been too many malls. They are still thriving in some places, which tells me they were probably overbuilt, and we are now seeing shrinkage; some places can still support them. That's part of it. And I know some people are very put off by the mall experience in the first place, which they associate with status symbols or social-class insecurity. But for Melody and me, malls have always been, largely, air-conditioned city parks, places to walk around in and occasionally buy things. Even now I often walk for exercise in Georgia Square Mall when the weather is bad and the gym is closed or doesn't suit my inclinations. On to happier news. Good keyboards with mechanical switches have become abundant again; they're called gaming keyboards, and I've just bought myself a Poseidon ZX that is tenkeyless (lacks the numeric keypad) so that I can keep the mouse comfortably close. When IBM introduced the PC in 1981, it had an impressively "clicky" tactile-feedback keyboard. In 1983, Compaq, followed immediately by a thousand others, introduced PC "clones" (workalikes) that had quiet, "mushy" keyboards, and most keyboards have been mushy ever since. The other day, while revisiting my old office at the Institute, I saw the Unicomp mechanical keyboard that they had bought me; of course, it's holding up well; mechanical keyboards last much longer than the ones whose switches are all plastic inside. So I set out on a quest, and this was the result. If I had it to do again, I'd probably go for their "brown" class of switch, which is slightly less clicky than the "blue" that I got. The Poseidon is backlit, and I keep the backlighting turned on because the key markings are otherwise a bit hard to see. Sadly, the shifted characters (such as ! @ # $ above 1 2 3 4) are not backlit. I've just made emergency last-minute alterations to Digital SLR Astrophotography, Second Edition. As it went to press, the book said, "I must sadly bid fond farewell to DeepSkyStacker" (my favorite image calibration and stacking software) because development of DeepSkyStacker had ceased and it was running into memory limits with newer cameras. That was what spurred me to develop a customized version of the PixInsight stacker as a substitute. But DeepSkyStacker is back. It has been ported to 64-bit Windows (thus overcoming the memory limits) and made open-source. I'm using it; it seems as fast as greased lightning. Accordingly, it will be covered in my book, along with Nebulosity, MaxIm DL, and PixInsight, with worked examples and screen shots. I just wrote several more pages for the book and dispatched them to the publisher. If you create web pages in raw HTML, as I do, the hardest part is putting the pictures in. The reason is that the tag for every picture needs to include its dimensions, so the web page won't move around as the pictures arrive. Traditionally, while typing one of these I have to get the dimensions of the image file by looking at its properties, or at least hovering the mouse cursor on it, then mentally noting the numbers that are displayed. Unless I use the handy gadget that I'm unveiling here. I've written a free open-source program called IMGtoClipboard that lets you right-click on any image file in Windows Explorer, choose "Create IMG tag on clipboard," and then paste the IMG tag into your editor from the Windows clipboard. To fully use the source code in Visual Studio, you'll need to acquire the free Visual Studio Deployment Project component from Microsoft. If you had happened to be at the Institute for Artificial Intelligence around 6 p.m. on April 2, you might have seen this state-of-the-art computer equipment being tried out. State-of-the-art for about 1982, that is. 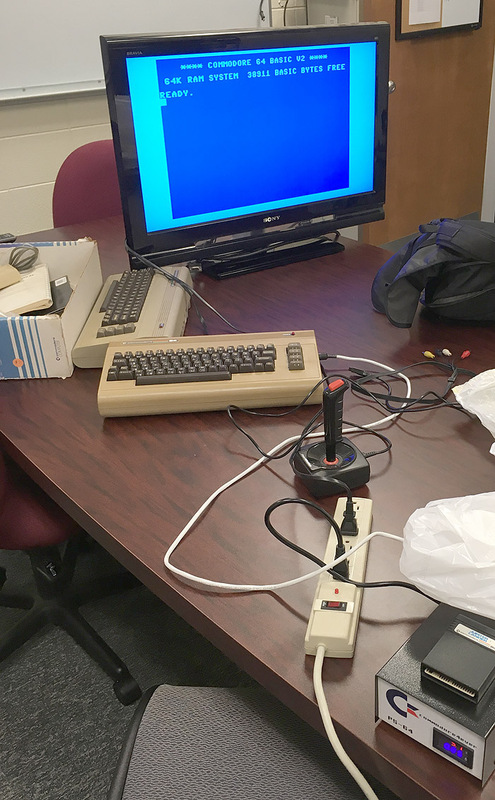 Some Commodore 64s that Cathy collected at yard sales some years ago are now in the collection of my colleague Fred Maier. A friend has asked my advice on restoring a radio made by RCA in 1933 or thereabouts, and its power supply circuit is distinctly odd. See the diagram above. This is RCA, so we don't expect inept engineering, and I don't think that's what this is. They were the best in the business. They were doing something strange deliberately. The B+ part of the supply is perfectly normal for the 1930s. There's a power transformer, a rectifier tube (type 1-V, later known as 6Z3), and two capacitors arranged in a pi-section filter with the field coil of the electrodynamic speaker. The B+ voltage is about 250 V.
But look at the taps on the transformer. One of them goes to four tube filaments in series, delivering 25.2 V at 300 mA. That is much higher current than the high-voltage portion of what is apparently the same winding. And then there is an even lower-voltage tap for the dial lamp. The normal approach is to have a high-voltage, low-current winding for the B+ supply and a separate 6.3-volt, high-current winding for the tube filaments in parallel and a 6.3-volt dial lamp. That would make for a simpler transformer. The one actually used seems to have one winding (as far as connections are concerned) made out of two different thicknesses of wire. That is a guess based on its electrical specifications. The alternative is that the high-voltage part has much more current capacity than necessary. Putting the filaments in series has a disadvantage. When one tube burns out, they all go dark, and you can't tell which one failed. If they were in parallel, only the dead tube would go dark, and you would know which one to replace. My wild guess? Maybe RCA had a surplus of transformers that were made for something else, and they designed this radio to use them up. Maybe, even, the transformers were made by mistake! Maybe some windings were tied together internally that should have been separate. I am not exactly sure what a transformer with 25- and 200-volt windings in series would be used for in the Roaring Twenties; maybe some reader can tell me! [Update:] Gene Greneker, K4MOG, writes to point out that this may have been a way of making the transformer smaller and lighter. A transformer for series filaments might require less total wire than one for parallel filaments — more volts but fewer amps. And then the high-voltage winding might be appended to the filament winding, rather than separate from it, so that it can be a bit shorter, again saving wire. As you know if you've been following the Daily Notebook lately, I'm finally getting back into my electronics workshop, where I was very busy in the 1980s and 1990s. I've done only a little work there in (gasp!) ten years or more. The reason is that in 2008 my consulting business started growing (and overlapped with my UGA job until 2013); in 2012 I hurt my ribs in such a way that for several years I was uncomfortable carrying things around; and just as that was easing, Melody's hip problems started, keeping me downstairs so I could keep her company. Things are getting back to normal, and I'm getting back in the workshop. An intense interest in electronics, encouraged by my father, was practically the beginning of my intellectual life. Electronics magazines in the 1960s covered everything from TV repair to astrophysics, and when picking me up after school in what must have been September 1964, my father placed into my hands the Summer 1964 issue of Elementary Electronics (click on the link to see it). It was an excellent place to start. At irregular intervals, starting today, I'm going to record some early memories related to such things, as well as newer projects. Carefully stored away upstairs, but perhaps soon to be put into service as a paperweight, is this Monarch MT-222 multimeter. 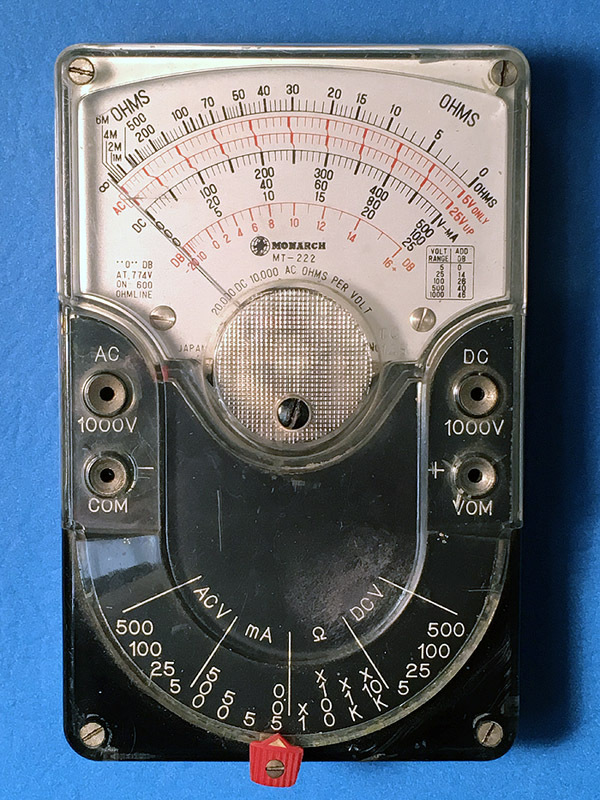 Back in 1964-65, as I was learning how to recognize electronic parts, test batteries, etc., I asked my father for a voltmeter, expecting something very low-end. Instead, he took me to Specialty Distributing Company in Valdosta and bought me this excellent instrument, excellent at least by the standards of the time. It's a Japanese imitation of the classic Triplett 310, which is still made, although of course the details are different. I got plenty of use out of it (and didn't have another multimeter until more than a decade later). One of the most interesting things to do was connect a solar cell to it and use it to compare light levels in different places. I could also use the ohmmeter to see if almost anything would conduct electricity. Why, by the way, does Triplett still make a meter almost exactly like this more than 50 years later? Good question. Easy to use it is not; the scales are small and hard to read unless you're used to them. Digital meters have ruled the world since about 1982. But in fact the question has a good answer. Meter readings of complex signals are affected by the properties of the meter. In some industrial electronics settings, the solution to the problem is, "If you can't beat 'em, join 'em." That is, let the meter take its toll, but always use the same meter. That is why the Triplett 310 and the larger Simpson 210 stay around. 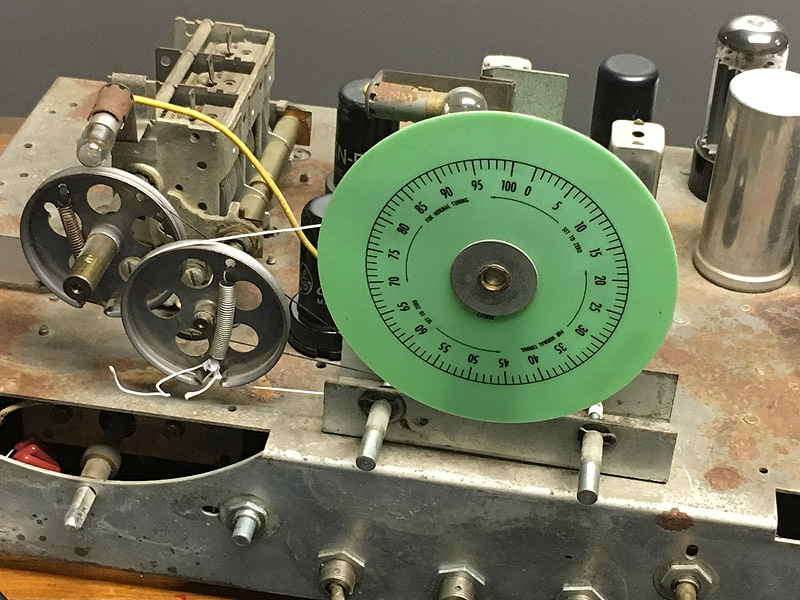 In maintaining older equipment, people want to get the same readings their predecessors did. Jim Mauldin (Melody's father) gave me a good example of this, decibel levels on teletype lines. The signal is very complex, and no two meters respond to it the same way unless they are almost identical. Today (April 1) I got my Monarch multimeter out for a good look. It has not worked in maybe 30 years, and I at least wanted to figure out what was wrong. The answer: Apparently some debris inside the meter movement; I was able to restore it to life, partly and temporarily, with puffs of air. But given its overall decrepit condition, I decided not to try a full repair. At least I got it to read 0 when not connected to anything. I'll probably keep it out as a memento of times past. 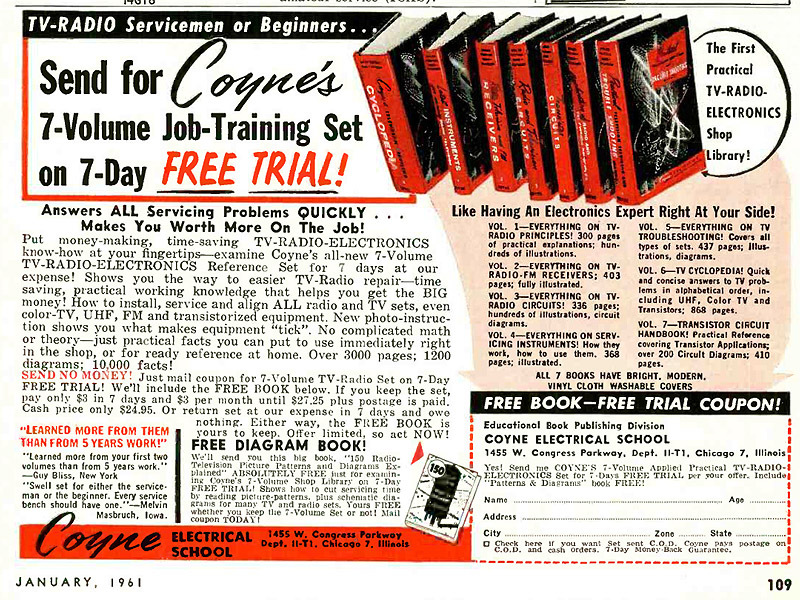 Also in 1964-65, my father surprised me with the set of books described in this ad. He had found them at a Valdosta pawn shop. Their red spines are conspicuous on my bookshelf. Most of them weren't, and still aren't, very useful. If I had been fixing TVs, the TV Repair Cyclopedia would have been some use. But most of the others were probably not much help to most of the people who bought them. They don't start at the beginning (like Marcus and Levy's Practical Radio Servicing, the first electronics book I ever really understood, a book that taught me something important about how to teach). Nor do they continue to the end. They have a 1940s flavor and seem strangely incomplete. But the last volume in the series, Louis Garner's Transistor Circuits, was worth its weight in Fahnestock clips. It is an adaptation of a book that also circulated widely by itself; you can see it on line here. Even though obsolete by the time I got it, that book kept me busy for years. Search for "Garner" in the Daily Notebook for more about it. Ordinarily, when you plug headphones into a Lenovo Ideapad 320, you get a pop-up message that an audio device has been plugged in, and then that's where the sound goes. However, many Lenovo owners, including me, have experienced an intermittent problem where the headphones are not recognized and the sound continues to come out of the speakers. I reproduced the problem today with 32-ohm Bose headphones (3-conductor plug), 32-ohm no-name headphones (4-wire plug), and 32-ohm Apple iPod ear buds (which are designed for the ears of a species other than Homo sapiens, apparently, but that's a separate problem). Then I rebooted, and the problem went away. The problem was not fixed by installing Lenovo's latest audio driver (from lenovo.com), version 6.0.1.8245; I did that a while back. However, I'm told that reinstalling the driver may fix it. Today I used Device Manager to disable Intel Display Audio (one of two audio systems), keeping Realtek High Definition Audio enabled. That may be what fixed it, although it didn't have any effect until after I rebooted, so I don't know if the reboot itself fixed the problem. When the problem recurs, I'm going to try an audio driver downloaded directly from realtek.com.tw. It's conceivable that the problem is caused by some switch or connection inside the headphone jack. But that doesn't explain why it occurred with 3 different sets of headphones and then was cured by rebooting.